Gently clean dirt and grime from various trim pieces! The Gyeon Vinyl Cleaner allows you to lightly clean your trim with ease. Whether you are looking to clean up some dirty trim, or prep it for a dressing, a good cleaner that does not leave behind any residue is key. The Gyeon Vinyl Cleaner is a gentle vinyl cleaner that will allow you to remove dirt and dust, leaving a pleasant matte finish and no greasy residue behind. Simply spray this unique formula onto a clean microfiber towel, wipe onto the trim, flip the towel to a fresh side, and wipe away any dirt and grime. Vinyl Cleaner will remove dust and dirt in a flash and the light anti-static properties help repel future dust buildup. Use this product on your exterior trim and even your interior trim pieces. 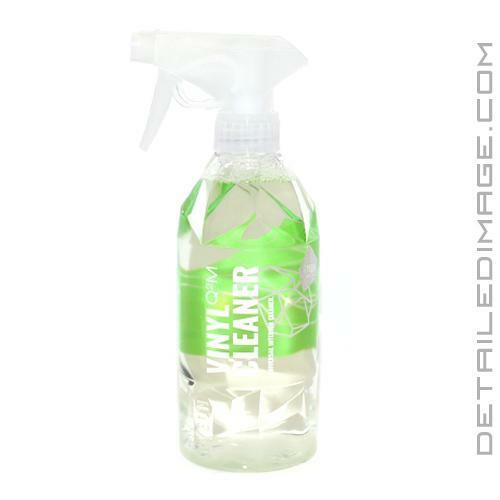 The light cleaning ability makes it great for everyday use. If you have any trim that needs to be protected or lightly restored, Gyeon recommends following up your cleaning with the application of Gyeon Preserve. Don't let your trim go untreated. Clean away dirt and grime with the Gyeon Vinyl Cleaner today! Spray on short-haired microfiber. Wipe the surface, then wipe dry with another side of the fiber if needed.